Someone we know recently passed this recipe on to us and it is delightful. It doesn’t have a lot of ingredients and you may feel like it isn’t enough for a loaf, but it is. Enjoy this gluten-free, no sugar added recipe! Blend eggs, mashed bananas, honey and coconut oil together. Mix the dry ingredients and then combine with wet ingredients. Pour into greased bread pan and bake at 350F for 45 minutes, or until you can insert a toothpick and it comes out clean. Hi there, just tried this recipe along with using coconut flour for the first time. When I mixed the dry and wet I got a huge dry blob, nothing that could be poured into the loaf pan. I ended up adding about two cups of water (yikes). Is there a liquid missing from the ingredient list? I’ll let you know how it turns out. You’re not the first to say this for sure. At first it may seem odd but it would have likely turned out moist while it was cooking. If you’re used to traditional flours, this is certainly different. I must try this recipe again soon, it’s been a while and I will remind people in the recipe directions that it may appear dry prior to cooking. I’m so sorry about what must have not been a great bread especially with the addition of water. I posted this recipe initially because it was easy to make and tasted so good. Like I said I will make it again soon and make revisions so people don’t get confused by what appears to be a dry mixture. I hope this doesn’t turn you off from baking with coconut flour as it can be very delicious. Thanks you so much for taking the time to give some feedback! Ah, I see. That certainly make more sense. It was the word pour that got me confused. So it did eventually bake after two hours but was not edible (no surprise there :)). I’ll definitely try again though, it smelled amazing! I made muffins because I didn’t have a loaf pan. Put in for 30 mins and they came out dry and crumbly. I also left out the chocolate chips because I didn’t have them either. Maybe only bake them for 20? I also used creamed honey… Would that have made a difference? Sorry to hear the recipe didn’t turn out as you wished. I just made this recipe as a loaf last week and made it 2 days in a row because it was so delicious. I’ve never made these into muffins but you’re right they may have been in too long. They definitely taste better with chocolate chips but that should not affect the moisture at all. It is certainly more crumbly than regular bread with gluten since it doesn’t have the ‘glue’ holding it together. It should however taste good and I don’t think the honey you used would be at fault either. Hope it turns out better for you next time. All the best on your journey to healthy eating! I found this recipe when I was looking for ways to incorporate coconut oil into my diet. I have made this bread half a dozen times since and I absolutely LOVE it! I don’t usually add the chocolate and nuts–I prefer the simple banana flavor–but the only other change I’ve ever made is to add an extra egg white when the mixture seemed too dry (I think the “large” eggs were a little smaller that time, and when I added the third egg white, it seemed to compensate perfectly). Otherwise, I think this recipe is amazing as it is–thanks for sharing it! Glad you like it! I’ve been making it again lately as I almost forgot about it and it has been amazing. 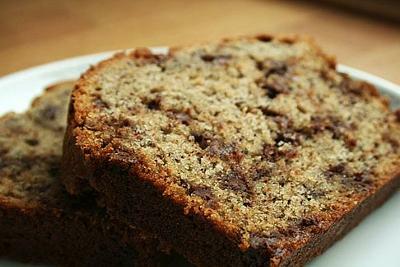 Great to have a healthy substitute for the banana breads most of us grew up on! Thank you for sharing, I’m happy to hear they turned out well as muffins. The reviews for this recipe have been mixed. I know I’ve made the recipe again recently a few times and I think it’s key to get very ripe (almost moist) bananas. They add moisture and of course sweetness to the recipe. Thanks again for sharing! hi, tried the recipe, and found it a large dry mass also, but totally surprised it came out as a solid loaf, coconut flours funny that way, but turned out great!! I used coconut instead of nuts, and regular chocolate chips, yum!! Hi, I’m just getting into this way of cooking and feeding my children. We just made the banana loaf together and everyone loved it. I left out the walnuts, because I was being lazy and put in a bit of coconut because I love it. Yum, thanks. So great…glad you enjoyed it! You will feel so different in many ways when you clear your body from the sugar and wheat that most of us grew up eating so much of. It really helps your brain function better and your joints will be less inflamed as well. Keep it up and thanks for the feedback! Amazing bread. Will make it again and again. Thank you. Great recipe, it’s my son’s favourite thing to eat.